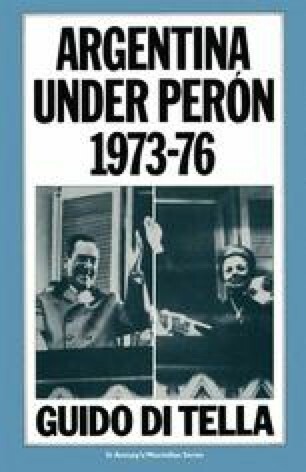 A few months before the end of 1973 a return of Perón was unthinkable. Nevertheless, a short succession of steps lifted nearly all restrictions and allowed an incredibly free election — incredibly free in view of the risks involved. The elections were won by the Justicialista coalition with nearly 50 per cent of the votes. This was not surprising, but it exceeded what the Government and even the leaders of the coalition had expected, particularly since Perón had not been allowed to run and his candidate was very weak. It seemed that, no matter what was done, electoral results for the Peronists would always be exceedingly good, a fact which reduced the influence of the moderates in the Front. In nine of the twenty—four electoral districts, its candidates exceeded the 50 per cent mark (Table 3.1) thus avoiding a second round, which was won in all but two districts. In these the official candidates named by the Cámpora group were at odds with the local Peronist caudillos, and they were lost to splinter Peronist parties fostered by them.